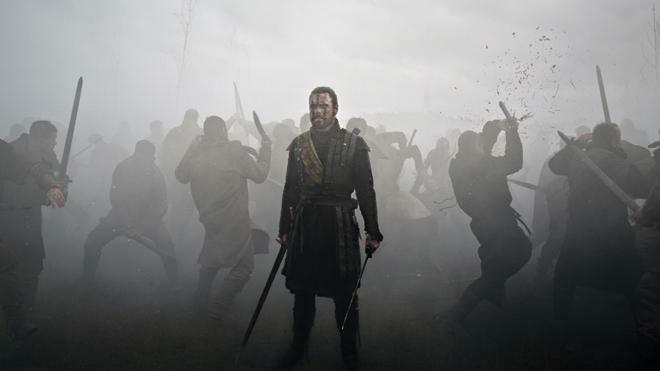 From the producers of The King's Speech comes the story of a fearless Scottish General, Macbeth (Academy Award© Nominee Michael Fassbender), whose ambitious wife (Academy Award © Winner Marion Cotillard*) urges him to use wicked means to gain power of the throne. A thrilling interpretation of one of Shakespeare's most famous and compelling characters, Macbeth is a dramatic re-imagining of the realities of war-torn times and a tale of all-consuming passion and ambition. "Tomorrow and tomorrow and tomorrow…"
When it comes to big screen Shakespeare adaptations, the source material's greatest strength (the Bard's original text, of course) also often proves to be a director's greatest challenge. After all, on the page or on the stage, the legendary playwright's poetic language is naturally given the proper emphasis that it demands -- but film is an inherently visual medium, and this presents a specific hurdle for filmmakers. Namely, what are they supposed to do with all those "words, words, words?" In Justin Kurzel's 'Macbeth,' the director opts to take on an aggressively cinematic approach, trimming down and reconfiguring the play's lengthy soliloquies and dialogue in order to create a more visceral and intimate experience. And while that does lead to some affecting imagery, one can't help but feel like there are some pieces missing between all of the "sound and fury." Based on William Shakespeare's famous play, the story focuses on Macbeth (Michael Fassbender), a Scottish General who plots to take the crown for himself. Spurred on by his ambitious wife (Marion Cotillard), Macbeth embarks on a dark and bloody journey to claim and maintain the throne. But as the pair's actions grow more and more nefarious, guilt and paranoia begin to take hold, threatening to unravel everything the couple has worked so hard to attain. For the most part, this is a pretty faithful adaptation of the original material, though Kurzel and his writers do make some notable embellishments and alterations that help to give this version a unique stamp. For one, the director opts to open the film by revealing that Macbeth and his wife have lost a child -- adding another layer to their relationship and subsequent decisions. This motif of children continues to play on throughout the film, including the addition of a little girl to the traditional trio of witches who bestow Macbeth with his prophecy. Likewise, a young soldier lost during the initial battle sequence makes a prominent reappearance as a ghostly apparition that carries Macbeth's infamous dagger, binding a tragically human face to the customarily floating weapon while shedding new light on the protagonist's increasingly fragile and scarred psyche. This focus on psychological struggles is further enhanced by the director's poetically visceral aesthetic. Gently quivering handheld shots give the film a palpably intimate air while the decision to lay several soliloquies over drifting visuals presents a decidedly internalized version of the material. A quietly somber air flows over the gorgeously composed imagery of mournful landscapes, and potent stylistic bursts heighten key sequences and dramatic turns. A slow motion technique used during battle scenes is especially noteworthy, turning isolated moments of carnage into delicately shifting shots that look like paintings briefly brought to life. With that said, the movie's emphasis on imagery over words does have some notable drawbacks -- especially since those words happen to be Shakespeare's. Much of the play's rich text has been truncated or moved about rather liberally in certain instances, and while this does give the movie a more concise and visually driven rhythm, I can't help but miss a lot of the excised material. On the one hand, it makes sense from a cinematic standpoint that Kurzel would choose to omit many of the play's more expository and stagey lines, but their omission actually makes the narrative a little hard to follow. Likewise, some of the director's blocking decisions work better than others. For instance, though I admire the stripped down single shot design of the sequence, Lady Macbeth's pivotal "Out, damned spot" scene feels oddly static and one-note. Macbeth's famous "Tomorrow and tomorrow and tomorrow" soliloquy fares a bit better -- with the distraught husband directly reciting the lines to his wife -- but it's still a little odd to have much of Fassbender's face obscured for the delivery. Thankfully, despite any staging inconsistencies, stars Michael Fassbender and Marion Cotillard turn in powerful performances. In the included special features, the filmmakers discuss their PTSD interpretation of Macbeth, and Fassbender plays up the man's gradually unhinged and traumatized mind "full of scorpions" well. 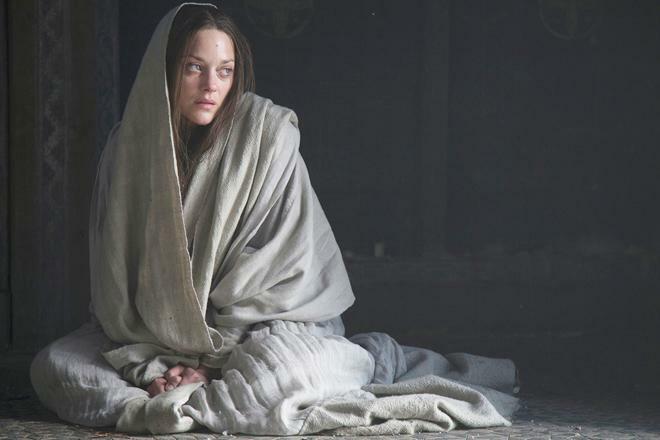 For her part, Cotillard is equally moving as Lady Macbeth, landing somewhere in the middle between the role's traditionally coldly manipulative temperament and other more sympathetic portrayals. As ambition turns to hubris and paranoia and guilt and regret, the pair slowly unravels before our eyes -- and each devastating turn is heartbreakingly realized with nuance and depth. Serving as a more overtly cinematic interpretation of Shakespeare's masterpiece, Justin Kurzel's 'Macbeth' presents an aesthetically powerful adaptation that emphasizes imagery and tone over words. Sadly, though the film's style is potent, some of the truncated text does make the narrative feel a tad unclear and incomplete. As far as big screen versions of the story go, Roman Polanski's 1971 film strikes a better balance between spoken word and visual storytelling -- but at its core, this is still a generally faithful and affecting take on the timeless "Scottish Play." 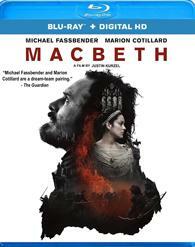 Starz/Anchor Bay brings 'Macbeth' to Blu-ray on a single BD-50 disc that comes housed inside a standard keepcase. An inset with instructions for an UltraViolet Digital HD copy is included as well. After some skippable trailers, the disc transitions to a traditional menu screen. The packaging indicates that the release is region A coded. The movie is provided with a 1080p/AVC MPEG-4 transfer in the 2.39:1 aspect ratio. Though beautifully shot, there are some occasional signs of compression that do hold the presentation back just a bit. The digital source is mostly clean, but there is some slight posterization and false contouring visible in shadows and dark skies. These artifacts aren't terribly frequent, but they're noticeable enough to warrant a mention. Thankfully, overall detail is strong throughout, highlighting the film's production designs and striking locations. Fine textures are readily apparent, especially on the characters' frequently bloody and dirty faces. Likewise, bright outdoor scenes tend to be the most impressive, offering life-like dimension. Colors vary depending on the scene, with many sticking to a deliberately somber and drab palette of blues, greens, yellows and grays. The movie's climactic fight scene is also noteworthy, as the screen is bathed in the bold red/orange haze of a burning forest. Contrast is well balanced, though black levels are slightly elevated. From an artistic standpoint, 'Macbeth' is rather striking on Blu-ray, but keen-eyed viewers might spot some sporadic compression artifacts. The film is presented with an English DTS-HD MA 5.1 track along with English SDH and Spanish subtitles. Delicate and aggressive, this is an immersive and well balanced mix. Dialogue is technically clean and crisp, but the cast's whispery accents do make it a little difficult to hear some of Shakespeare's famous words. Overall atmosphere is strong and enveloping, naturally spreading general ambiance around the room for specific locations. The commotion of a military camp or the gentle breeze of the Scottish countryside all come through with appropriate surround use, and voices and effects are moved about directionally when called for. Specific sounds like crackling fire, falling rain, and bellowing thunder all enhance the mood. Likewise, action scenes feature appropriately aggressive design work with clanking swords, boisterous battle cries, and deep LFE. The haunting score also comes through with strong fidelity and separation. Nicely textured, the audio mix creates a convincing soundfield that will make full use of your home theater rig without overwhelming your senses. Making Macbeth (HD, 8 min) – This is a standard behind-the-scenes featurette with cast and crew interviews. The participants discuss their interpretation of the material, characters, and casting. Though very brief, there are some worthwhile insights. Q&A with Michael Fassbender (HD, 20 min) – Recorded in October 2015, this is an informative Q&A with the star. Fassbender discusses his take on the character, the director's vision, rehearsals, tackling Shakespeare, challenges on set, and what it was like to work with the rest of the cast. 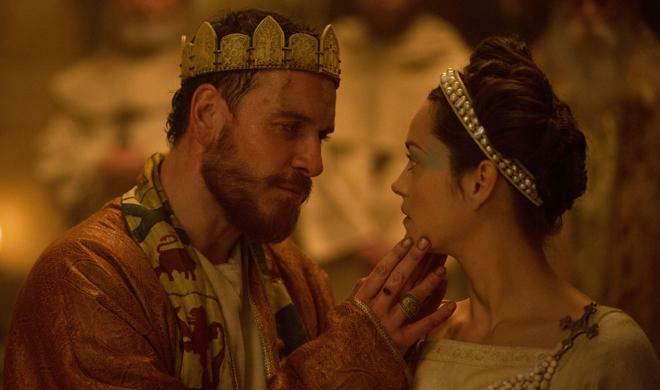 Justin Kurzel's 'Macbeth' is a visually striking yet occasionally patchy adaptation of Shakespeare's famous play. Though the imagery and performances are powerful, some of the truncated and rearranged text makes the story harder to follow. The video transfer is solid but there are some sporadic artifacts. Thankfully, the audio mix is exceptional, offering an immersive and moody experience. Supplements are fairly sparse, but the included featurette and Q&A provide some decent insights. Though not the best big screen version of the material, this is a very well made adaptation. Worth a look.